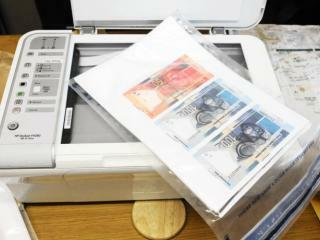 Cape Town – A Table View property owner walked into her tenant’s office and found photocopies of R100 notes on a table, the Bellville Specialised Commercial Crime Court in Cape Town heard on Tuesday. “I asked him what he’s doing, and he said he’s pressing money,” said Moira Venter, testifying at the trial of web designer who has pleaded not guilty to illegal possession of equipment for the manufacture of counterfeit bank notes. “I asked ‘are you serious’, and he said: ‘Yes, because I haven’t got any’.” Charles Duckitt has also pleaded not guilty to a second count of forging or altering bank notes, and two counts of presenting counterfeit R100 bank notes for the payment of petrol and arrear rental. Duckitt had rented two cottages from the Venter couple, adjoining their home. Duckitt used one cottage as his residence, and the other for his business premises. Venter said her husband worked on an offshore rig, and returned home every second month. She lived alone with their minor son, and for security reasons the couple were happy to have Duckitt as their tenant. Venter initially got on well with Duckitt, and found him to be someone she could relate to. She allowed him to use a small space in her own home for business purposes, when he could no longer pay for both cottages. But things changed when he began moving around her home freely. Duckitt’s counsel claimed it was in fact Venter who made the counterfeit notes, and not him. Defence attorney Hailey Lawrence asked Venter why she failed to terminate Duckitt’s tenancy, if she was unhappy with his presence. Venter said Duckitt had an alcohol and drug problem. “He was a man who needed help, and it’s only human and compassionate for me to help someone like that,” she said.